Jump on one of our luxury tour vehicles and travel to the Grand Canyon National Park from Las Vegas! It's an adventure you will be talking about for a lifetime. Your tour includes a Mercedes Sprinter van that will seat up to 10 guests. The van is equipped with individual leather captain seats and USB power outlets to charge your electronics. Visit the Grand Canyon National Park South Rim from Las Vegas in our luxury Mercedes Sprinter. Each Sprinter is equipped with air conditioning, panoramic windows, and leather captain seats. You'll be traveling in style and enjoying the ride while our professional tour guide takes the wheel and offers you a journey of a lifetime. Guests will have the chance to visit the Hoover Dam for a 15 to 20-minute photo stop. Afterward, our professional tour guide will drive and narrate through the Mojave Desert en route to the Grand Canyon along the historic Route 66 to Williams, Arizona. Your tour includes a comfort stop at a gift shop in Seligman, Arizona. Once at the South Rim, you will spend 2 hours and 45 minutes visiting popular interest points. 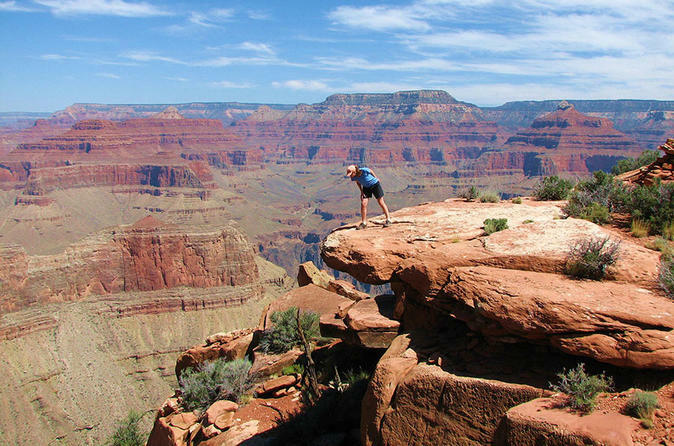 You'll have the luxury to walk along the Rim Trail to see the most extensive and most profound parts of the Grand Canyon from Bright Angel Lodge, Mather Point, and Yavapai Point. A light breakfast snack, lunch, and bottled water are included. You will begin your trip back to Vegas with a comfort stop to In-N-Out Burger in Kingman, Arizona. We also stop at Chipotle for our vegetarian lovers. Your average hotel arrival time is around 9:30 p.m.